At $350 the camera is a cheap way to dabble in the new format, but the quality leaves a little to be desired. Spherical video lets your friends not only see your adventures, but also control what they see. 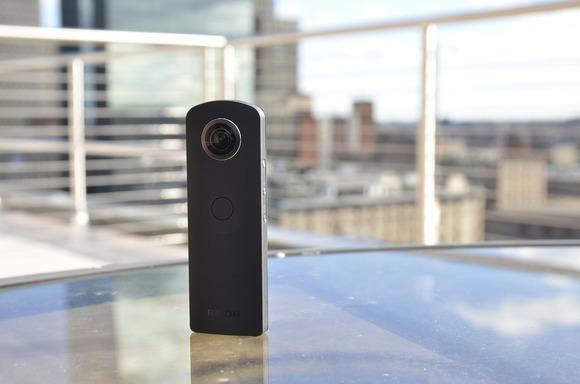 The Ricoh Theta S is the newest piece of hardware that can capture and process video and images in 360-degrees. While it's not perfect, the $350 price point puts the technology in reach for early adopters. The camera hardware is easy to use. There are only a few buttons: shutter release, power, WiFi and video/photo toggle. The software, on the other hand, requires a lot more skill to use, navigate and understand. Spherical images and video change the way you take pictures and shoot video. By clicking the shutter button you're capturing everything around you at once. That also means that unlike in panoramic shots on your phone, people who are moving through the frame won't look like ghosts. There are two ways to post or edit images and video: pair the camera with your smartphone via WiFi Direct, or hook it up to your computer. The app can be hit or miss for on-the-go posts. It is better for images than video. Unfortunately one of the only sites that supports spherical image interactivity is Ricoh's own. Creating spherical videos is a multi-step process. Connecting the camera to a PC is straightforward, but a Mac can be tricky. Here's a tip: if you want the camera to mount as a drive on your Mac, hold down the shutter and WiFi buttons simultaneously as you plug it in. After that you can move the video and images to your desktop and use the Ricoh software to render them into spherical ones. The only mainstream sites that support 360 video are YouTube and Facebook. The camera itself is small and portable. There is nothing protecting the lenses and since they shoot in 360-degrees, dust and scratches can be ruinous Exposure settings are controlled globally on both lenses and exposure is metered using the lens on the side with the shutter button. That meant when I shot video at a hockey game, the ice was completely overexposed. Some of the best spots for spherical videos and images are indoors. When you shoot them outside, about half of the frame is sky. One of my favorite locations so far has been the inside of the Boston Public Library, which has ornate artwork and detailing on the walls and ceiling in addition to a marble staircase. There isn't a lot of hardware that can shoot spherical videos and images and there's almost no competition at this $350 price point. But the video quality and software need to be improved if Ricoh wants this to go mainstream.